Real Road Racing details a time when American auto races were held on the real roads of towns large and small. We call it the days of chain drive, wooden spokes, and hair-for-helmets with good cause. This fine book delves into the politics, thought process, and learning curves associated with putting on such a large-scale event in a region of the U.S. that nobody knew much about. In 1909, the automobile was just coming into being, as was much of Southern California. 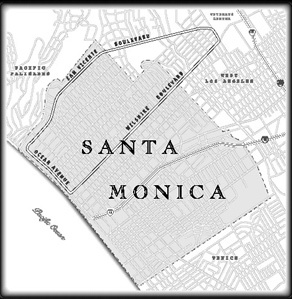 The city of Santa Monica was struggling to maintain its independence from annex-crazy Los Angeles and decided to stage road races to attract attention and build a population base. It worked. The American Grand Prize and Vanderbilt Cup races were held at Santa Monica in 1914 & 1916. The biggest names in racing were here. You can learn all about it with your copy of Real Road Racing. We have added a 6-part YouTube video of the Santa Monica Road Races. Check it out yourself. The video augments the book, which you can purchase below. By the way, that is not a "green screen." 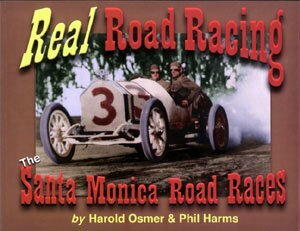 Order your copy of REAL ROAD RACING, The Santa Monica Road Races 1909-1919 $25. 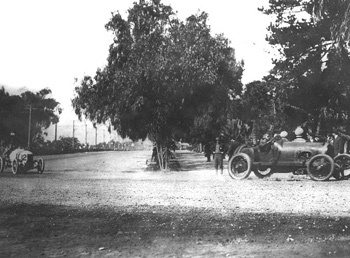 Santa Monica Road Races were 1909-1919. Start/Finish was at Ocean and Montana, headed south. 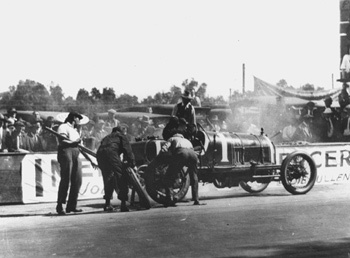 Newspapers and promoters dubbed the turn at Wilshire "Dead Man's Curve" in order to generate excitement for the spectators. Go figure. The course went uphill along Wilshire to the Old Soldier's Home (Veteran's Center today) then back down on San Vicente. At 8.4 miles per lap, the course was considered radically short for its day. Race cars of the Real Road Racing era were primarily stripped down street cars. With fenders, lights, and carriage work removed, these machines were quicker than their stock brethren but they were also as prone to break downs. 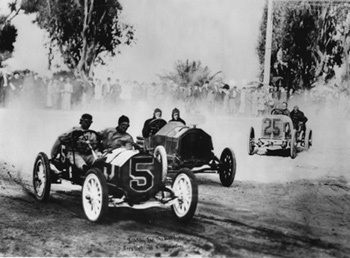 Harris Hanshue won the first Santa Monica Road Race in an Apperson Jackrabbit averaging 64 miles per hour for 202 miles (24 laps) over the 8.4 mile course. 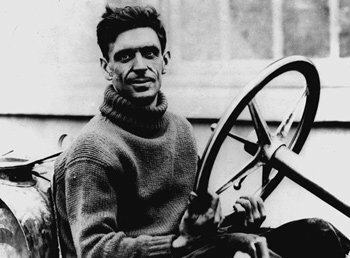 Shown here in a later photo, Hanshue also bears the distinction of being the first driver to crash at the LA Motordrome. He had to be carted off in a horse-drawn ambulance. Barney Oldfield, exemplifying the days of chain drive, wooden spokes, and hair-for-helmets. This 900-cu. inch 4-cylinder Fiat was fielded by LA-based Maier Brewery whose Maier Select was its featured brew. "Select Kid" on the hood was the first time something other than an auto maker name billboarded a Southern California race car. Ya gotta love this shot! 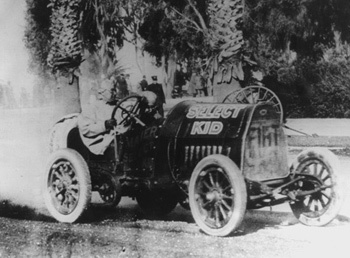 Joe Nikrent raced in five Santa Monica Road Race events, finishing second in the Medium Car division in 1911 and '12. He and brother Louis would combine to compete in 10 Santa Monica races overall. "Dead Man's Curve" or "the Death Curve" were common phrases used to stir the imagination of newspaper readers. The drive along Ocean to Wilshire trends downhill. A swift 90 degree left hander onto Wilshire leads uphill, making this a tricky corner. No one ever died racing at Dead Man's Curve, but the first injury took place there during the 1910 event when a man sitting high in a palm tree fell 20 feet to the ground, breaking his left arm after George Clark's Cutting smacked the tree. Terrible Teddy Tetzlaff was as fearless as they came. His knickname was earned by virtue of his hard driving style and the terrible way he mistreated his equipment. Win or break. That was Teddy. 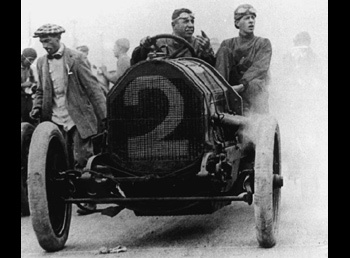 He played a role in the 1913 silent movie Speed Kings featuring Mabel Normand, Mack Sennett, cameo roles by several drivers, and actual race footage from the 1913 event. Pit stops at Santa Monica involved getting the biggest guy you could find to heft up a wedge 'o lumber to lift the car while your guys changed tires. 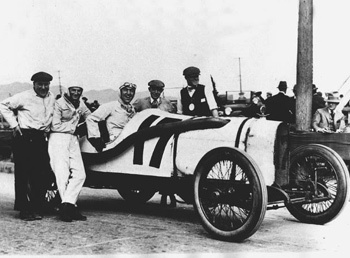 The racers always carried a mechanician along to help in the event of a breakdown along the course. If anyone other than a crew member assisted a car, that car would be disqualified. In the days of Real Road Racing, races were held on, well, real roads. Spectators often lined the course to catch a glimpse of the action. 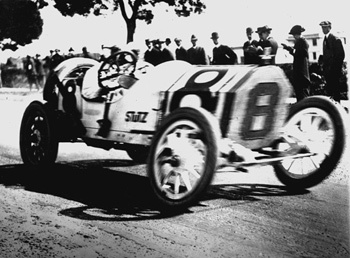 Earl Cooper won in 1913 and went on to be national AAA Driving Champion in 1913, '15, and '17. His venerable #8 Stutz is on display at the Petersen Automotive Museum in Los Angeles. Fate and the odds finally caught up to Santa Monica when Lewis Jackson failed to negotiate the "S" curve along San Vicente. At nearly 100 miles per hour, his big red Marmon jumped the curb, knocked down two trees, and spread debris over a wide area. Jackson was killed instantly, as was lemonade vendor Lulu Juratch. A camera operator and spectator died an hour later at the hospital. 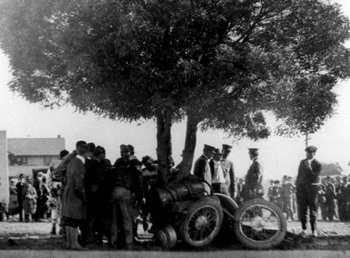 Mechanician John Ghianda was thrown clear and managed to walk unassisted to the hospital. 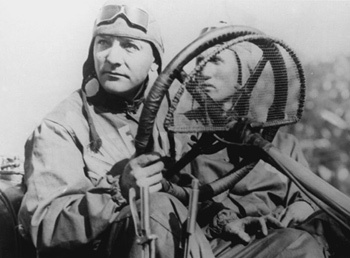 Captain Eddie Rickenbacker is perhaps best known as America's Ace of Aces in World War I. Prior to that, he sold and raced cars with great acclaim. Many attribute his mechanical ability and deftness at handling racers to his later success. No doubt the traits are related. Dario Resta at the wheel of the most significant race car in American racing history. 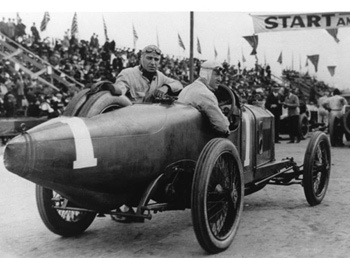 The 1913 Peugeot he piloted to victory at the 1916 Vanderbilt Cup in Santa Monica was one of three racing Peugeots. But this particular car paid a visit to the shops of Harry Miller for an engine overhaul just prior to the Vanderbilt Cup race. Harry Miller engine designs later begat Offenhauser. "A Lot of people after driving a race like that would have cried aloud for some stimulant such as wood alcohol. Resta simply requested a bottle of milk, and drank the same to the dregs before dismounting." LA Times, post-race story for 1916 Vanderbilt Cup race. Get yourself an autographed copy of REAL ROAD RACING, The Santa Monica Road Races, 1909-1919 today! $25.